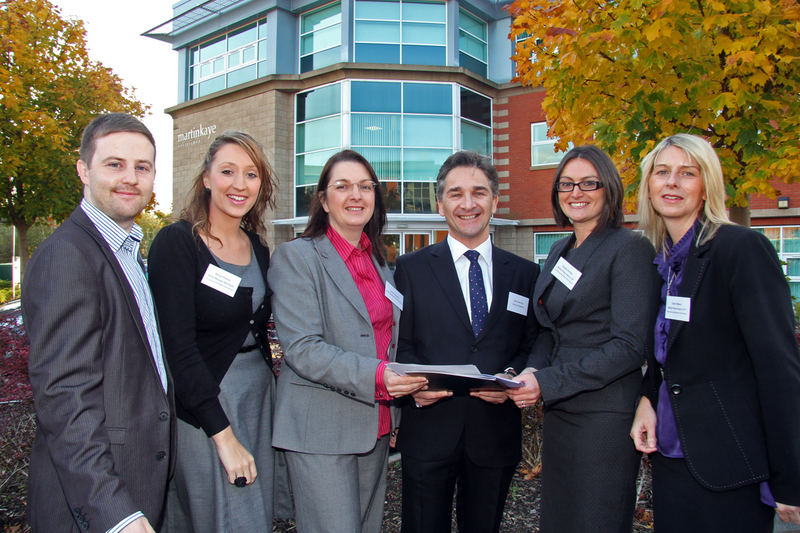 Shaping future legal careers was the topic of a seminar which attracted professionals from across the Midlands. The event was organised by the Shropshire and Mid Wales Branch of the Chartered Institute of Legal Executives (CILEx) and was open to anyone training for a future in the legal profession. It was held at our offices in Euston Way, Telford, and around 45 delegates attended. Branch vice-chairman Sophie Davies, who works for Martin-Kaye, said: "We were extremely pleased with the turnout and we had a good mix of delegates - from students just starting out, to part-qualified and many fully-qualified chartered legal executives. "Our aim was to give them an insight into how becoming a member of CILEx could help develop their career and to explain that the training programme was a really viable alternative to a university degree." Delegates on the day heard from guest speakers Nick Hanning (president of CILEx) and Hugh Anton-Stephens - a public notary and a mental health tribunal judge. Presentations were also given by Lynne Squires who explained the CILEx training route, and Kelly Davies of Fodens Solicitors who shared her experiences of the CILEx scheme and how she became one of the first legal executives to be made a partner in a law firm. Delegates were given advice on CVs and interview techniques too, and enjoyed a buffet thanks to sponsor Adrian Mason, from Advance CPD in Shrewsbury. Our senior partner, Graham Davies, said: "The conference was a great success and the atmosphere was buzzing with ideas and enthusiasm. At Martin-Kaye we're always keen to encourage our staff to continue to develop their skills and the CILEx training programme has proved extremely popular with many of our legal executives. "We're very happy to support the local branch of CILEx and to see so many professionals taking such an interest in their approach to training." The conference was a free Continuing Professional Development event and feedback from the delegates showed it was a huge success. One of our lawyers has been helping construction industry firms experience the harsh reality of ignoring health and safety rules. Tina Chander is working with the Health and Safety Executive, and the Working Well Together initiative to help improve awareness of the guidelines. And now she has taken part in mock trials at Telford Magistrates Court and Stoke-on-Trent Magistrates Court acting on behalf of the Health and Safety Executive. "We're very pleased to have been involved in such an interactive experience and hope the construction firms who attended took away some sound advice that could change their opinions," said Tina. "The trials were a great opportunity for them to learn more about health and safety in the construction industry through a practical session that really brought home the consequences of ignoring important rules." In each mock trial, the case involved a worker who had been injured by an underground electricity cable, and a prosecution against his employers. "As directors or senior managers, our delegates need to make sure things go right for their business every day. Our mock trial explained what can happen when things go wrong and a worker is injured. "HSE prosecuted not only the employer but also the managing director and delegates experienced the whole criminal trial procedure. "In reality, the magistrates would judge the case on the facts and arguments presented to them by prosecution and defence lawyers, but at our events, the audience decided the verdict for themselves. We ended with a discussion of the verdict and its implications, and the legal team also took questions from delegates about the process." The mock trials were run as part of the Working Well Together project - a construction industry initiative to improve health adn safety in the sector, particularly for small and micro-sized businesses. The project runs through a network of regional groups who stage events designed to provide information on a wide range of construction industry topics and issues with support from the Health and Safety Executive. Staff from our personal injury team have helped to raise vital cash for the Midlands Air Ambulance. They sponsored an AFC Telford home match at the Buck's Head ground, and received a signed team shirt. So they decided to donate the shirt to the Midlands Air Ambulance charity to help them raise money at a fund-raising event. Martin-Kaye partner Alison Carter, who leads the personal injury team, said: "The charity auctioned the shirt at a James Bond themed evening at The Shropshire, in Muxton, and their efforts have raised over £450 from the evening so far. "At Martin-Kaye we're very keen to support local organisations and it was excellent to see the signed shirt boost the total for such a worthy cause." And it's not the first time the personal injury team has supported the Midlands Air Ambulance. Every year they volunteer to help the charity with a gift wrapping service which takes place in Telford Shopping Centre. "Once again this year we'll be wrapping presents in our own time in return for donations to the charity as we believe it's an organisation that deserves all the support we can offer," said Alison. Midlands Air Ambulance is the only charity responsible for funding and operating three air ambulances serving Shropshire, Gloucestershire, Herefordshire, Staffordshire, Worcestershire and the West Midlands. Since 1991, the charity has responded to more than 37,000 missions averaging 3,000 per year or nearly 10 each day, making it one of the longest established and busiest air ambulance organisations in the UK. Employers from as far afield as Birmingham snapped up places at our latest social media workshop within hours of its launch. Over 50 businesses attended the breakfast event which aimed to help employers get to grips with managing the new forms of communication. And the event was so successful that we're already planning more seminars as we have a waiting list for places. Our senior partner, Graham Davies, said: "We have been astounded at the response to this presentation, and it was incredible to see all the places filled within just a few hours of advertising it. We have clearly hit on a topic that business owners are concerned about and that is particularly relevant, so we are already planning a series of events to pursue the topic in more detail." The seminar was hosted by our Head of Employment, John Mehtam, who gave employers an insight into the current risks associated with Facebook, LinkedIn, Twitter and YouTube - and advice on how to avoid the pitfalls. "Hardly a week goes by without a controversial comment on a social media network making news, and we wanted to ensure employers had a clear idea of just what their staff were saying and how to handle it," said John. "We have already dealt with many cases involving this new media, and the aim of the seminar was to help employers work out a policy of how to manage it and deal with any consequences. We also gave our delegates an example of a social media strategy that they were able to take away with them and put into practice in their own business." The seminar covered a wide range of topics including: an overview of the latest cases and their impact on employers; monitoring and investigating; discipline and dismissals; media management and protection of reputation; social media and policy and content.